It’s hard to know who to trust when your life is at stake and even the good guys have been known to lie about what they know. The world building in this book first becomes evident by the sometimes odd ways in which the characters speak. Archaic words are effortlessly mixed in with futuristic slang and references to cutting-edge technology. Strictly speaking this isn’t steampunk, but I do see some influence from that genre in the ways in which the characters communicate about certain ideas. It took me a few chapters to adjust to some of their odder uses of syntax, but once I did I really enjoyed learning about how Cary and Krin think in particular based on the types of words they choose to use and how they string them together. I never quite became comfortable with being introduced to a new scene only for it to end so rapidly. The inclusion of extremely short scenes works well in the introduction because of how quickly the plot heats up, but I would have preferred to have more time to settle into later scenes once various subplots begin to bump into one another. Mr. Schultz’s scenery descriptions are not to be missed. The earth has changed a great deal over the past few thousand years, and the best passages in this story describe how humanity has adapted to some pretty extreme climate shifts in North America. Enough time has passed that none of these dangers are particularly newsworthy to characters who have never known any other way of life, but as a reader I really enjoyed quietly comparing their world to my own. There was also a lot of telling instead of showing in this novel. Due to the large cast of characters I certainly wouldn’t expect every thought or emotion to be conveyed to the reader indirectly, but it was difficult to remain invested in what happened to certain individuals when so much of what I know about their personalities come from the author directly telling me what kind of people they are instead of uncovering it for myself. 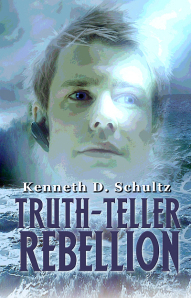 I would recommend Truth-Teller Rebellion to anyone who has ever read a post-apocalyptic book and wondered how humanity would adjust to such a cataclysmic change in their circumstances over the course of several millennia.